FLOW Northside 2015 is officially underway. Now in its tenth year, the annual arts crawl continues to celebrate arts and community in North Minneapolis. The festivities kicked off on Thursday with a block party that incorporated dance, discussion and visual art. It continues on Friday with various gallery showings, arts activities, performances and food leading up to the main event on Saturday. 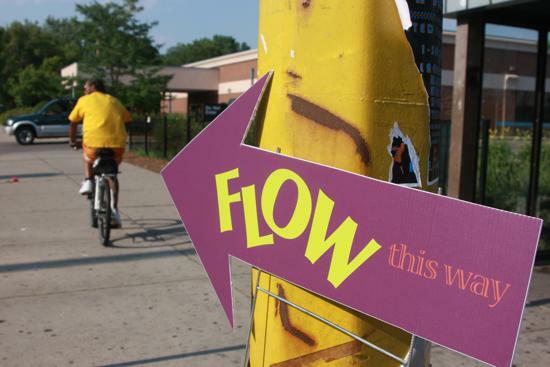 For their 10th anniversary, FLOW has expanded to include Plymouth Avenue. And they’ve increased the number of artists with links to Minneapolis’s North side. Below are some top picks for this weekend. While most of Juxtaposition’s events are slotted to take place on Saturday, on Friday, early birds can check out the North Minneapolis art hub’s newly opened storefront. The storefront was designed and remodeled by a handful of JXTA’s own instructors and apprentices. For a small fee, those looking for a more hands-on experience can also bring a shirt to make their own textile or screen-print. Other pre-printed gear and apparel will also be on sale. On both Friday and Saturday, FLOW will be showcasing its 10th Anniversary Photography Retrospective. The retrospective provides a visual history of FLOW through the lens of both amateur and professional photographers. It also provides the backdrop for NEON (Northside Economic Opportunity Network)’s fashion show on Friday at 6 p.m. The show features local designers and retailers, some of whose work will also be on sale the following day at NEON’s pop-up fashion boutique. Those itching to roll up their sleeves and get their hands dirty can do so via this weekend’s mural painting. Northside illustrator and muralist Melodee Strong will lead the making of a large community mural, near Clipper Cuts salon. Strong is one of ten featured artists whose work is a part of FLOW’s 10th Anniversary postcard series. West Motors lot – 2011 W Broadway Ave. In the vacant West Motors lot on West Broadway, festivalgoers can participate in an interactive installation consisting of live chainsaw woodcarving by Jason Soderlund, as well as live painting from jewelry artist and painter KNZ. PLOT is an Uptown gallery space and clothing store bringing their work to the Northside for FLOW. Homewood Studios is one of two Northside community-oriented art galleries open on Plymouth Avenue this weekend. In addition to the contemporary multimedia art that occupies the gallery space, arts lovers may also be able to catch some of the artists whose work is on display (some of their studios also share the same space). Plymouth Ave Art Studio next door will be open as well. In its fifth year at FLOW, the West Broadway Farmers Market continues to work towards providing access to locally grown foods in North Minneapolis. The artisan market aims to do the same for local art and artists. Hip-hop legends Roxanne Shanté and Kool Moe Dee headline the KMOJ stage this year from 5-7 p.m. A slew of local artists will share their talents as well, including Chadwick Phillips, Eemanna, Diane Robinson, Lothario, The NightStones, Mike Dreams, Khem Clan, MC Longshot, Osiris James, Drew Hopkins, Chris Hagedorn, Nate Blomquist and more. Between sets, concertgoers can also grab a bite at one of the food trucks and check out some of the art and merchandise being sold by vendors. On a stage just outside the Capri Theater, KBEM Radio and Voice of Culture Drum and Dance/New Space are curating and hosting an afternoon of music and dance. Elder and poet/storyteller Naima Richmond will open the event, followed by poet Joe Davis at 12 p.m., along with a number of other performances and interviews throughout the day (including a North High alumni dance recital). On Saturday from 12-5 p.m., the NAZ Youth Zone will also be open in the same space. As part of FLOW’s ongoing efforts to foster new talent in the community, an Emerging Artists Exhibit will be held at C&J Barbers. Featured artists include Briana Watson, Nagashia Jackson, Tamira Jade Mason and Christopher Williams. To catch the Established Artists counterpart to the Emerging Artists Exhibit, visitors can head to EMERGE Career and Technology Center at 1834 Emerson, where there will also be 3D printing and other activities. Visitors will have the opportunity to explore ideas on urban planning and public transit through art. “Tactical Urbanism” is a collaborative lab that involves “transit engagement activities,” some of which are based on exercises originally created by urban planner James Rojas. JXTA instructors will lead workshops in charcoal gesture drawing and Notan paper cutting, two drawing techniques of the organization’s Visual Art Literacy Training program. Visitors can also make buttons in the graphics lab or check out the portfolio show. More information on FLOW Northside events can be found at flownorthside.org. Many events and organizations also have their own Facebook pages. Brandon Brown opens the door to the garage behind his North Minneapolis home–his workspace since he was a child–and apologizes for the mess. Half of the space is crowded with tools and mechanical odds and ends, while the other half is taken up by a stage on four wheels, with seats and handlebars at the front. “The bicycle stage,” he calls it.